Don’t be so quick to invite Robert Mueller to your end of March martini serving bash, market bulls. 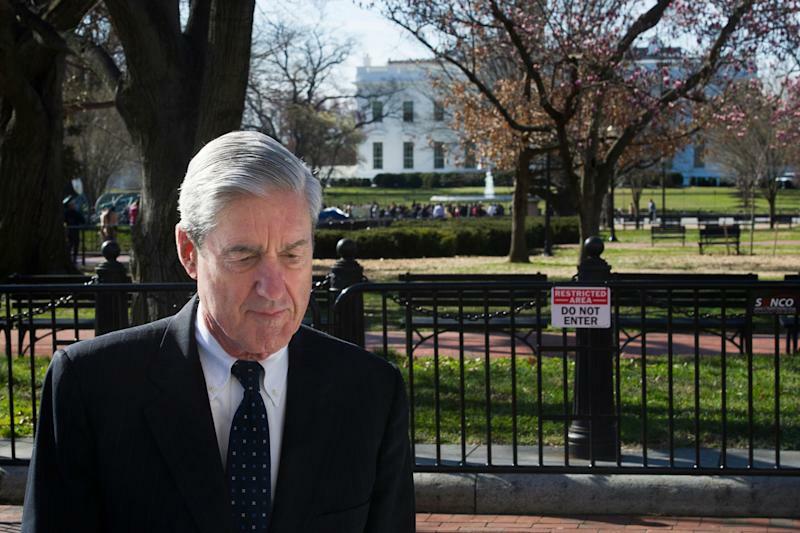 Special Counsel Robert Mueller didn’t find President Donald Trump’s campaign or associates colluded with Russia, per a report from Attorney General William Barr delivered to Congress on Sunday. Mueller further lacked sufficient evidence to prosecute for obstruction of justice, said Barr. But Mueller stopped short of exonerating Trump. The first instinct by bullish investors — who were pounded over the head last week following a too dovish Federal Reserve meeting — is to slam on the buy button Monday on weakness (overseas markets puked overnight). After all, buying the dips is a strategy that has worked wonders yet again since the Christmas Eve lows. Such a strategy appears to make sense as an impeachment of Trump looks less likely, meaning more time for him and Senate Republicans to try and stimulate growth via reduced regulations and an infrastructure plan. It’s unlikely a progressive-led corporate tax hike will now be in the cards, at least until after the outcome of the 2020 presidential election. But to back up the truck on stocks right now simply because headline political risk has receded (a bit...) would be folly. Doing so would ignore all of the negative factors that have built up in the market in March, and which finally started to get some long overdue attention late last week. Unbeknownst to many except those who closely watch the market each day, much of March brought with it a host of negative data points. They have been hard to see amid the market’s push back to the September 2018 highs. But taken together, the negatives call into question the pressing need to pay up to own a more expensive broader market or hot tech names such as Netflix and Amazon. First, there was the meager headline February employment report gain of 20,000. Wall Street quickly blamed the brutal miss on inclement weather. Right. The tepid employment report arguably was corroborated by the Federal Reserve, which at its latest meeting revised lower its GDP outlook for the next two years. Factor in a slightly more dovish Powell press conference than most expected, and the sense out there in the markets is that the Fed knows something the forecasters — and investors — don’t. Not enough worry for you who love to trade headlines? Well, the overly dovish Fed meeting led to a yield curve inversion on March 22 — that marked the first time it has happened since 2007. Markets tend to see yield curve inversions as a harbinger of a recession, understandably so. Historically, a U.S. contraction follows roughly a year after inversion, according to data from TD Securities. A recessionary backdrop is obviously not good for stocks. “The yield curve inversion is the latest concern to come to the forefront on the ongoing carousel of concerns. We would place the inversion of the yield curve on the negative side of the ledger,” said Lerner. The inversion of the yield curve doesn’t mean, however, stocks are instantly going to tank. Historical data shows mixed performance, but with a downward bias, especially three months after the date of the inversion. The machines that run the market are programmed to sell on negative news such as this one. 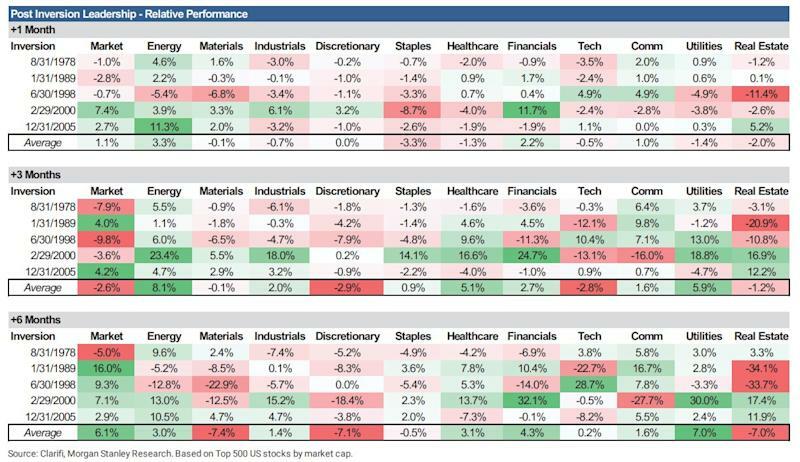 Riskier sectors of the market such as tech and discretionary tend to be hit the hardest as investors seek the relative safety of utilities, communications, and cash. Markets tend to have a downward bias after the yield curve inverts. To Wilson’s point of a potential earnings recession, Corporate America has done very little of late to boost the view of an earnings acceleration in the first half of this year. In fact, earnings that have trickled in this month suggest a second consecutive lackluster earnings season come April. Global economic bellwether FedEx laid a big fat egg with its most recent quarter and outlook. Founder and CEO Fred Smith sounded more like a man worrying each night about a global economic slowdown during a conference call with analysts than pitching confidence things will get better. Meanwhile, luxury goods purveyor Tiffany & Co. delivered a weak fourth quarter on the back of soft demand in Asia, Europe and the U.S. It doesn’t see earnings recovering until holiday 2019 (good luck). And even though Nike’s latest quarter was impressive compared to most in retail, it showed slowing profit growth in most geographies. North American sales missed analyst forecasts, too. Tepid reads on the European economy this month don’t help sentiment, either. Is it great that investors will unlikely have to sit through presidential impeachment proceedings on C-Span? You bet. Is there always something for investors to fret about? Sure. For instance, there is no U.S. trade deal with China with April right around the corner. Boeing’s troubles could lead to a sizable markdown to its earnings outlook — and those of key names in its supply chain — which may wallop the Dow given the plane maker’s outsized influence on the price weighted index. But getting too excited on the Mueller news would ignore the growing fundamental reasons to play things a little more cautiously after a nice year-to-date rally. “We think after the reflex rally, the market is in a battle between fear and greed where volatility pickups for several months,” Lerner added. The market deserves a few good tests here.